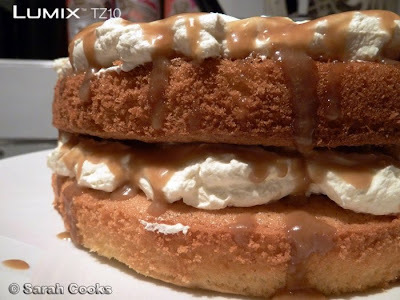 Light and fluffy sponge cake, mounds of whipped cream, and generous drizzles of caramel sauce. Evil, pure evil. That is how my boss described the caramel-sponge cake that I made for our office bake-off, to raise money for Jeans for Genes. Prior to the day, I wasn't sure what to make and bring. I didn't want to go for anything too common, like a standard Swiss roll or carrot cake. (I'm glad I didn't, as other people brought them!) Having said that, I didn't want to make anything too weird and challenging. In the end I chose a recipe I'd had my eye on for a while, but never tried - Donna Hay's caramel sponge cake recipe, from Modern Classics 2. It ticked all the boxes - cheap and quick to make, a little different, but not inaccessibly so. I never used to be good with whipped sponge cakes, but buoyed by the success of my recent Swiss roll, I thought it'd be alright. 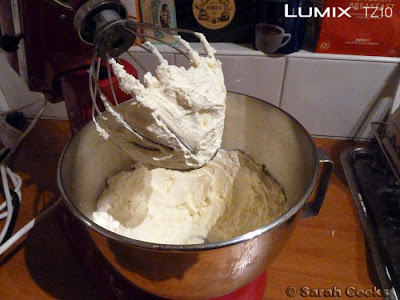 The cake is a very simple sponge - just whipped eggs and sugar, with flour and melted butter folded through. The volume decreased a little as I folded the flour in, but it didn't seem to affect the finished product too much. I must say it smelled a little eggy after being baked, but I had a sneaky taste test (scooped some out of the middle with a teaspoon), and it tasted like normal cake. Next time I might use some vanilla extract to counter the egginess. ...which you simmer rapidly for 8 minutes until well mixed and thickened slightly. (It thickens more as it cools). 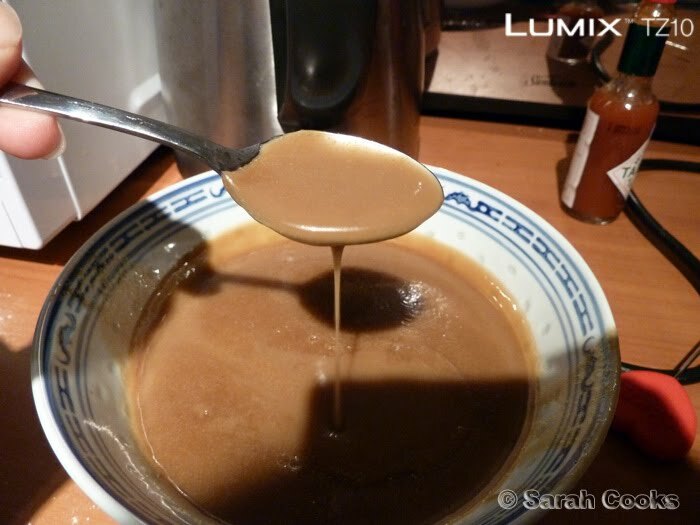 I used light muscovado sugar, as that was all that I had, and I think it gave the finished product a nice, deep caramel flavour. Pardon me while I do a few (dozen) taste tests! Then I had to whip the cream. I was in a mad rush, as it was already midnight by this stage, and I still hadn't packed my bag for the next day or cleaned anything up, and in the distraction I, er... whipped the cream quite a bit more than I normally do. Oops. I was scared it had turned to butter, but I tested it and it seemed fine. Just. (Do we see a theme here?) This was lucky, as it was 12:30am and I didn't have any more cream. Phew! Anyhoo... assembling the cake is easy, as it looks better a little messy. I think you're aiming for the "billowing clouds" look with the cream, and the "Jackson Pollock" look with the caramel. Repeat with the next sponge cake, and you are done! The next day, I carried it on the tram all the way to work, and luckily, it arrived unharmed. We had about 15 cakes all up, and mine came 2nd and was auctioned for $40. Yay! My boss (who judged the bake-off) described the cake as pure evil. 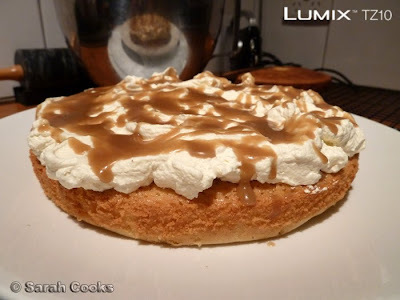 It tastes all light and fluffy, but definitely packs a mega calorific-bomb. I recommend small slices, if you can restrain yourself! I think of this cake as an easy crowd-pleaser. 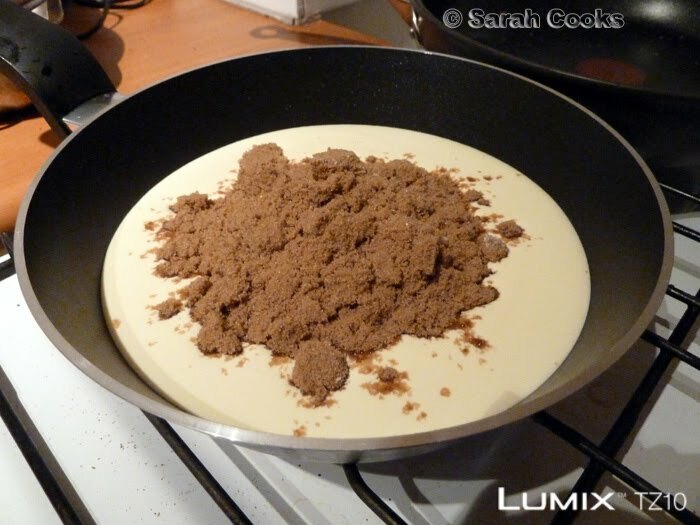 Don't forget to enter the draw to win your very own Panasonic Lumix TZ10! Just leave a comment on my post here. The competition closes this Friday! Woah, I can feel the sugar crawling through my system just looking at it, but while my head says no no no, my mouth and stomach says YES YES YES. I gotta try this! Sometimes naughty is good! That looks amazing!! OMG look at all that caramel sauce just dripping off the side. Can I lick it?! What was the winning cake? What a great looking cake! 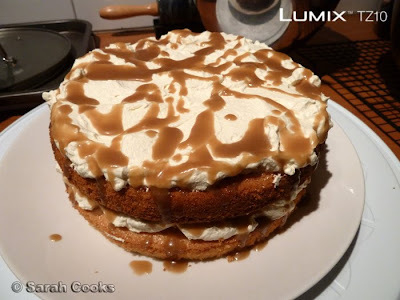 I love caramel at the best of times but combined into the cake form outlined here would be irresitible for me! I LOVE caramel. The caramel sauce method is interesting but I like how simple it is. Well done coming second, can't imagine what would beat that! Hi Sarah, Looking for a good recipe for caramel sponge cake for my son's birthday. Just found this on the internet and it looks fantastic but the actual ingredients are not listed so I can not make it. I guess I'll have to find another recipe. Samantha - My policy on republishing recipes is here. I do not type up recipes on my blog because I cook from the same sources again and again, and it would be a breach of copyright. The source of the recipe is clearly stated, so you can find it yourself.